Today I stopped at King Street Church's annual Country Fair, where I ran into Linda, who is the fair's chairperson this year. 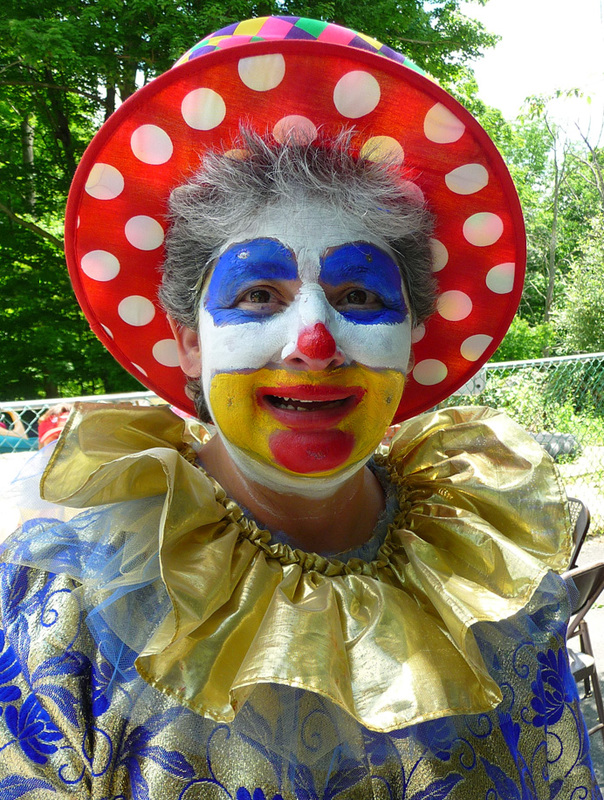 It is not mandatory for the chairperson to dress as a clown, but Linda has a flair for marketing, and she knew this would be a hit with the kids. I was a clown, too, in the dietary sense. I had a sausage-and-peppers grinder nearly as big as my forearm, positively sloppy with grilled onions. I also had homemade strawberry shortcake, liberally laced with sugar and covered with a mountain of whipped cream. Plus a can of Sierra Mist (not the diet kind, either). And a cup of coffee to keep me awake during the postprandial 2.3 miles of my walk. Calories eaten: 1175. Calories burned during the entire 3.5-mile circuit: 433. The Devil made me do it. "It's only once a year!" he whispered. "And it's for a good cause!" I have a solution, though. I'll walk the circuit again this evening. There's a full moon. It'll be lovely. .